Is it just me or is life getting busier and more hectic? If you feel the pressure of time constraints or having to fit so much into your day that the first thing to suffer is your own health & fitness, then keep reading, this article is for you! As the world around us seems to speed up I feel as if we are at the point of being busy for the sake of being busy. When we catch up with friends and they ask “how are you?” we subconsciously answer “I’m so busy” instead of putting any thought into our actual answer. We are becoming overwhelmed with our crazy busy, time poor lifestyle that we barely make any time for ourselves and the things that are really important to us…. And there should be nothing more important to us than our health! Without it we have nothing. For someone whose entire business revolves around being passionate about helping people prioritise their own health and fitness, it is no surprise that I am a big believer in putting yourself first when it comes to your health, fitness and physical & mental wellness. You know the drill on the aircraft “place your own oxygen mask on first before trying to help others” – if you are no good, then you are no good to anyone else! The good news is that we can work on our health and fitness without overcomplicating it or spending hours and hours doing so or needing a full gym set up. Keep it simple! 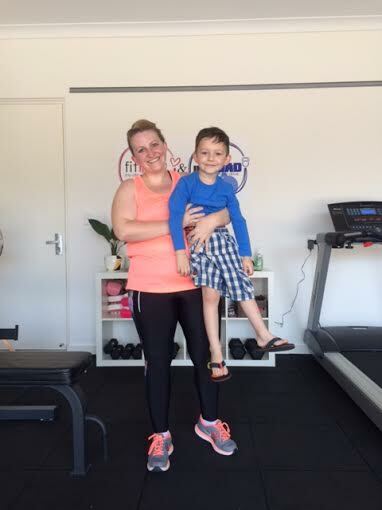 As a busy mum of 2 and a business owner, I often have to fit in a fast paced workout at home in any spare time I can grab (often with kids next to me joining in). At first you might need to make the time and change your normal routine a little to fit it in but if you are prioritising your health and fitness then this is something you need to be doing! If President Obama can fit in a workout every single day, then so can we. I mean, how busy are you?? So, you’ve managed to find some precious time to yourself and are ready to get started…. 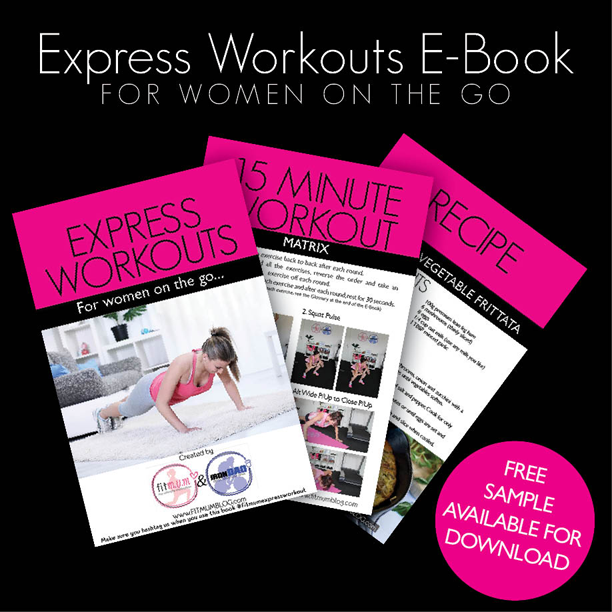 I have compiled a list of 5 fantastic exercises that you can do at home. They will provide you with a full body workout and can be done in as little as 10 minutes. If you have longer, that’s great, repeat them again. I recommend doing 20-30 seconds on each exercise with a 10 second rest in between and trying to complete as many rounds as you can in the time you have. It really is that simple! Give it a go, what have you got to lose? It will get your heart rate up, it will work your major muscle groups, you will sweat and you will definitely feel amazing afterwards! The only workout you regret, is the one you didn’t do! 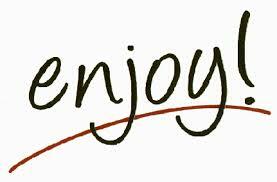 So, make the time for yourself and remember how important your health is to you! For other simple, at home workouts and health information, come and join in the FitM.U.M community here or get the whole family involved and visit us at FitM.U.M & IronDAD here. 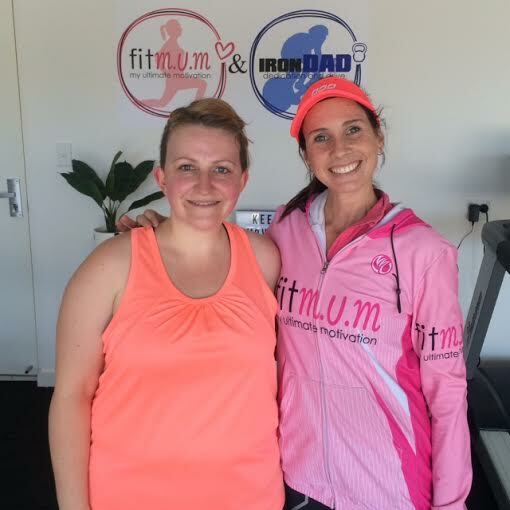 The lucky winner of our FitM.U.M 8 Week Summer Body Transformation, Cassie is just about to start week 4 and will be half way through this 8 week program. However, knowing Cassie and the amazing changes she has made and the way she has embraced the exercise and nutrition changes, this will just be the start of a whole new lifestyle for her. I am so impressed with her motivation and determination to work hard no matter what. She is a wife and a busy mum of 4 and works part time while trying to juggle everything else that a busy life entails. She has previously suffered anxiety and depression and I am so glad that she entered this competition and made the commitment to do something for herself and start her journey towards a healthier, happier and more active life (for her and her family!!). What a fantastic role model for her children! 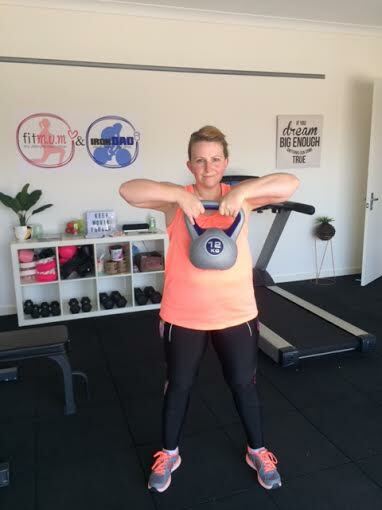 As well as seeing Cassie’s physical strength improve and fitness increase, one of the best things as a Trainer is to actually to witness her confidence and self belief grow. She is changing her life and becoming a much stronger and happier person because of it. The workouts I have given her have been HARD but she has done every single one of them with no excuses! Wow! What an amazing three weeks it’s been. Kelly has given me a workout plan every week consisting of body weight exercises, weights and cardio. She also provided me with some awesome food advice. I was totally shocked when I read my first workout plan. I thought there was no way I was going to do it. I had six days of workouts with one rest day and Monday consisted of two workouts! But I did it! I completed the whole week and I felt amazing. During week two Kelly came to do a PT session. I was really nervous, but didn’t need to be, she made me feel completely comfortable and didn’t mind helping me to correct my technique and to pick her brain. It’s now week three and I’ve thoroughly enjoyed the whole process. Next week I go for my massage I won as part of the competition, can’t wait. I hope this story may help, inspire or motivate someone else who has their own challenges and may be starting their health and fitness journey (or thinking about starting). Set yourself goals and do it for yourself! Today is your day to get started. Head over and join our wonderful FitM.U.M community on Facebook to stay motivated with other likeminded people! 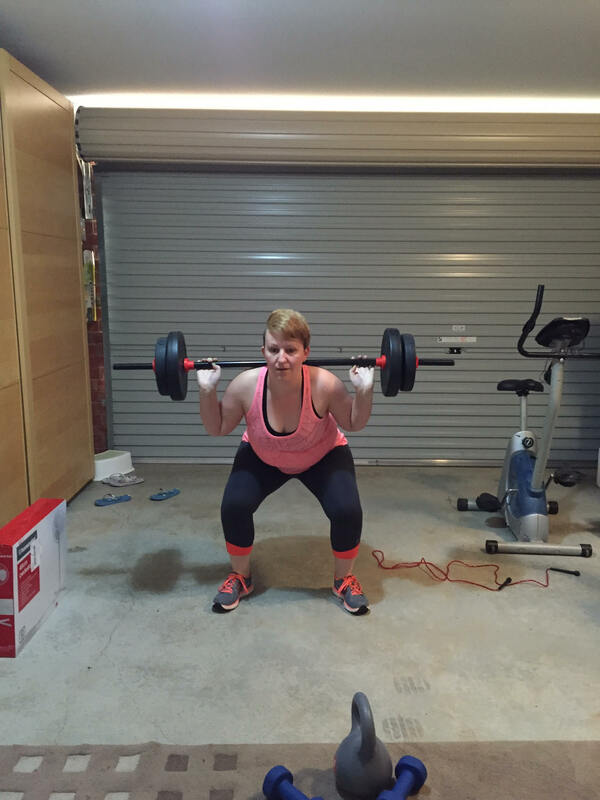 A FitMUM’s busy week… if you can’t find the time, make the time! It’s no secret that there is a lot to fit into a week, especially for mummies. I am lucky enough to currently be on maternity leave (bubs is now 4 months old) but some weeks I still struggle to fit everything in to a week. It’s crazy! This week was quite a busy one for us so I thought I would use it as an example and elaborate on how I make time (even if it’s only a small amount of time) for myself and to make sure I fit some form of exercise in every day. Like a lot of you, it was back to school for my eldest daughter this week after a busy and fun filled holidays and it was immunisations for my youngest. Irondad is in training for a short course duathlon on Sunday which he has set a pretty high expectations and goals for himself (EDITED post race to say that he smashed it by the way but that’s a different story!). We’ve had plenty of appointments, visits and of course all the household jobs that don’t do themselves as much as we’d like them too. So at the beginning of the week I knew I would have to work hard to fit in my exercise and not use any of that as an excuse to let it slide. 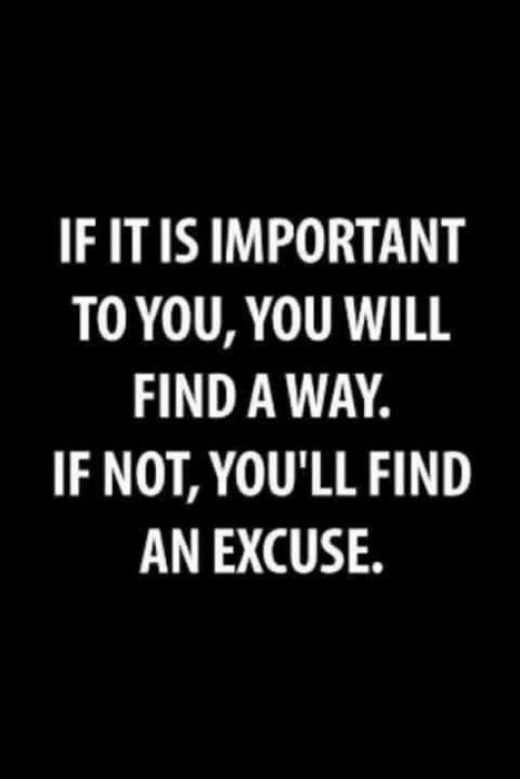 It is easy to say “stuff it, I’ll just skip it today” but that can lead to the next day and the next day and before you know it you’ve changed your habits again. That is self-sabotage, try hard not to head down that path. Keep your motivation high and remind yourself of your goals. I am constantly reassessing my short term and long term goals to help me stay focussed and always have something to work towards. 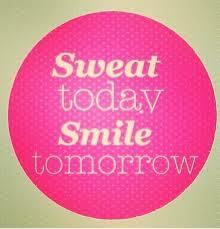 I do this in life and in fitness and I find that it really helps me stay motivated, accountable and achieve things. 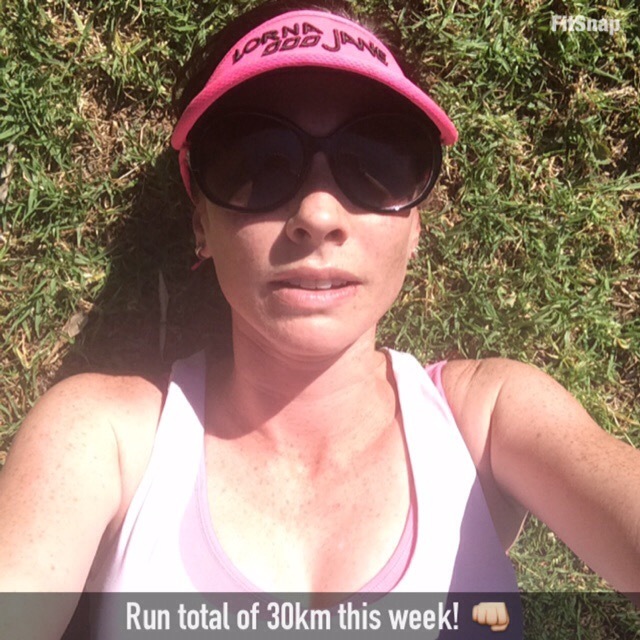 My week from Sunday to Sunday included 7 runs (1 treadmill interval training run and 6 road runs) ranging from 4km – 7.5km, 3 x HIIT sessions, 1 Gym session and stretching and foam rolling (my old muscles can get a bit sore after running and foam rolling is perfect for easing those knots in your muscles). * Thursday my little one had her immunistations late in the afternoon and I hadn’t had a chance to do anything beforehand. That night we were having dinner at my parent’s house (they have a treadmill) and I didn’t want to be too far away from bubs, so going out for a run was out of the question as was the gym. I planned to get to my Parent’s house a bit early, got baby to sleep and did a 40 min interval session on their treadmill. It was actually a great sessions because it broke up my running week and provided intervals and heart rate training that I wouldn’t otherwise get on a road run. I was sweating hard, burnt mega calories and it gave my dodgy knee a bit of a rest from the road * all boxes ticked*. * Friday I had a full on day so once Irondad got home we decided to do our weekly food shopping as we knew we had a busy weekend and wouldn’t get it done. Never one to miss an opportunity, once we had loaded everything into the car, including the children, off they went home with Dad and I ran home from the Supermarket. It is only 4.5km to our house but at least I fit it in, otherwise it just wasn’t going to happen. Do you know, the bonus of this is that by the time I got home all the shopping was put away too. I also did a quick 10 minute HIIT session out the back when I got home to finish the session off. I am usually dressed in my workout gear, you never know when you can improvise and squeeze in a quick run when you are out and about. As you can see it is not rocket science and if I can fit these little exercise sessions in, hopefully you can too. Sometimes you just need to think outside the box and use 20 minutes when you can grab it. The shorter the timeframe, the harder you should push yourself! It all counts. I am just an average mum like everyone else, who’s time is in demand but all I do is make sure I plan and prioritise so that I don’t miss out! I am so thankful I have such a supportive family too. If you have to go somewhere as a family on the weekend make sure you wear your workout gear (or at least have it with you in the car along with a hat and suncream and earphones if you like to run with music – be prepared and you can’t go wrong) and get dropped off on the way home and run there. Make sure you pick a distance you know you can comfortably run and increase it each time. I’ve actually lost count of the number of times I have done this. Sometimes the family even pace me in the car and drive along side me for part of the run. My 7 year old loves yelling out the window to encourage me. If you can’t find the time, make the time! I have done previous posts about the importance of planning and having a goal, read here https://fitmumblog.com/2014/09/29/good-choices-planning-a-goal-results/ it’s the only way to get things done. So, even a busy week can be just as productive, it’s what you do with your time that counts. The choice is YOURS. Try this awesome High Intensity Interval Training (H.I.I.T) session. Give your maximum effort and get maximum results. You will feel amazing afterwards and you will burn more fat doing this type of workout and continue to burn calories long after you’ve finished! Now that’s a bonus! Perform each exercise for 45 seconds with 15 seconds rest between exercises. Enjoy this full body …session. 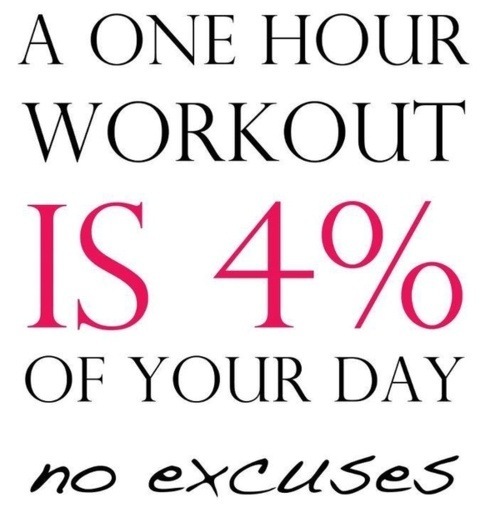 It will take 10 minutes so if you are feeling brave and want more of a workout… do it twice!